jdaEPGMoreInfo is a TAP for the Topfield HD PVRs. 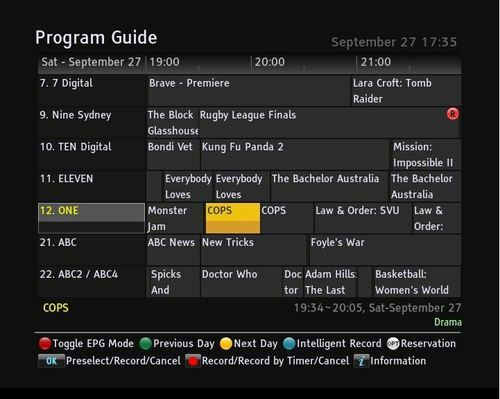 It adds the ability to search the Program Guide for the current event on the EPG or for any program that you specify. 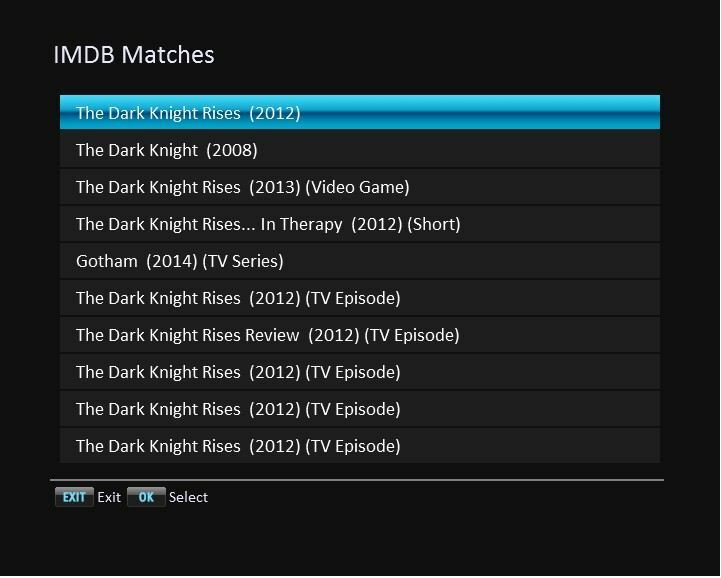 It can search via Genres as well, for example to find all Movies, or all Sports programs. 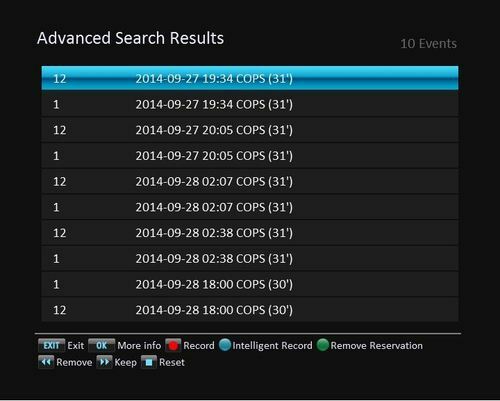 Optionally you can set it to record the found program via a One-time recording or IR. 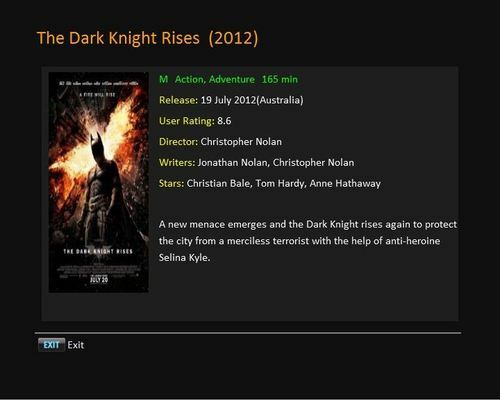 It can also find associated information from the IMDB site (Internet connection required). 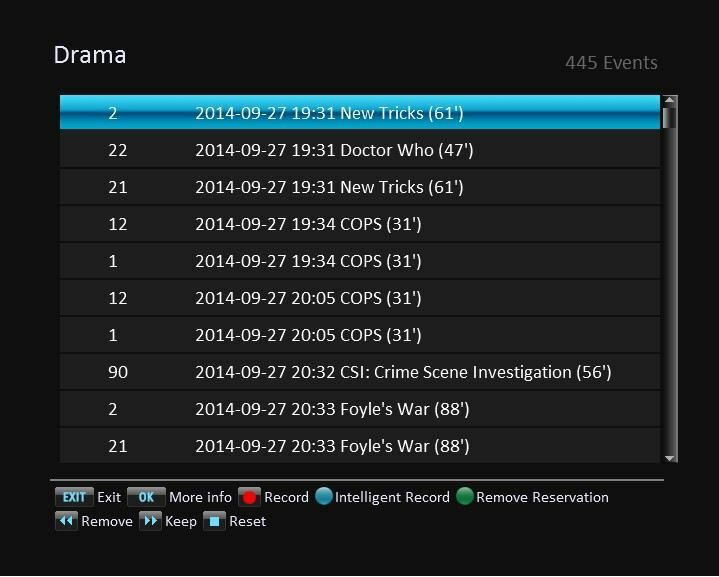 It can also run a daily EPG Scan to keep your EPG up-to-date. 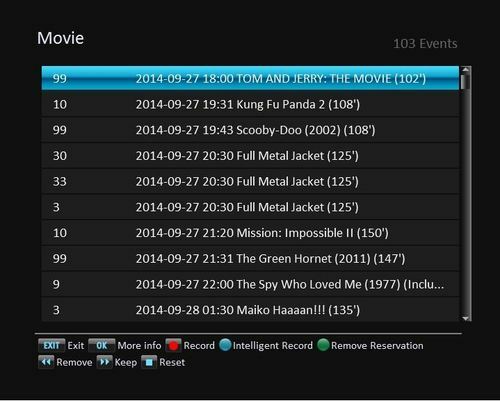 To install the TAP, upload the .tap file for your PVR to the /ProgramFiles folder using either FTP/HTTP, or a USB key. 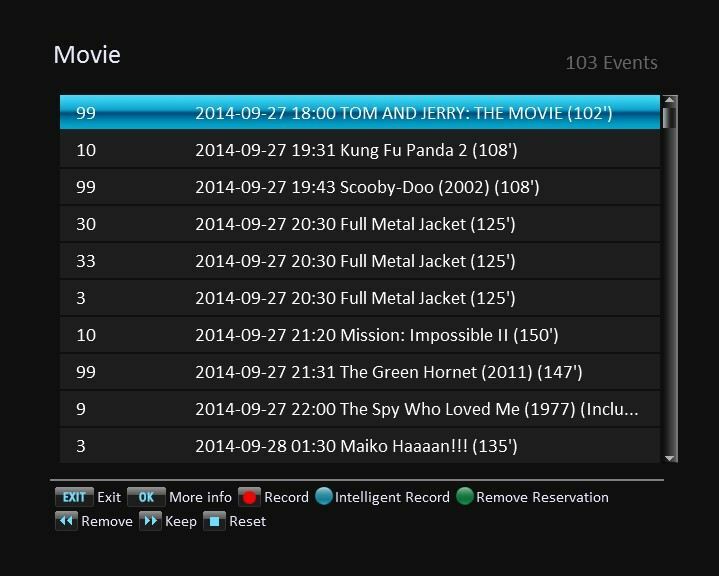 Manually start the TAP from the PVR by going into the Recorded Program list and pressing the » key (FFWD) until the “Program Files” list is displayed. Scroll to the TAP and press OK to start it. Once started the TAP name will be highlighted in green. When you're happy with the TAP and would like to start the TAP on every restart of the PVR, move the TAP to the /ProgramFiles/AutoStart folder. NB. This TAP uses several Firebird fonts. Please check that you have the following font files in /ProgramFiles/Fonts: Calibri_12.ufnt, Calibri_14.ufnt, Calibri_20.ufnt. If not, please download the fontpack from this link. 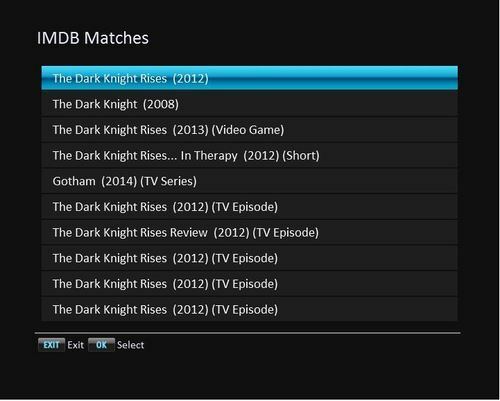 To use the IMDB feature copy the files movieget.sh, moviedetail.sh, and wget to the folder /ProgramFiles/Settings/jdaEPGMoreInfo. 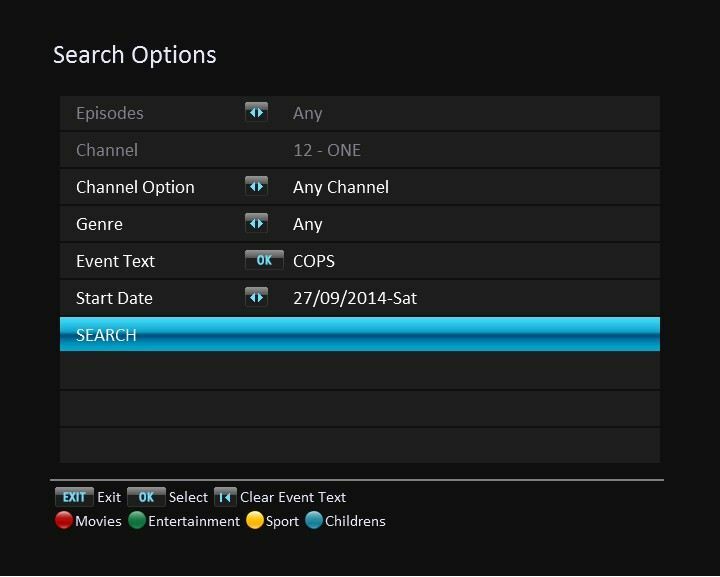 To use the EPG Scan feature you must enable it via the menu. Also remember to set the time you want to run the scan. When running the scan, the TAP will change the TV channel to the first channel in each network and will leave it for 5 minutes to allow as much EPG data to be captured as possible. Therefore to use this feature it would be best to set it for a time when no one is watching the TV. 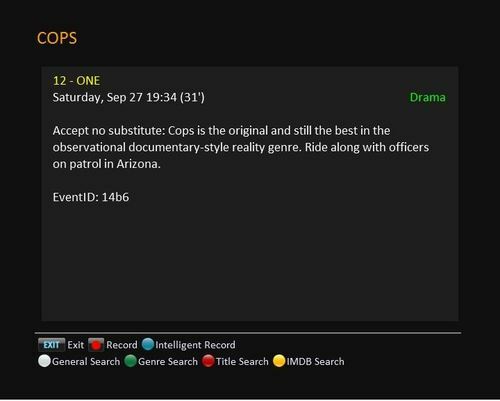 If you tend to turn off your PVR when not in use then set a timer so that the PVR wakes up before the scheduled scan is due to run. To configure the TAP you will need another TAP called TMSCommander. This is available here but it isn't required for normal operation. Using the menu you can change the TAPKEY (the key used to bring up the Search Screen), how the searching works, and whether/when to run the EPG Scan. 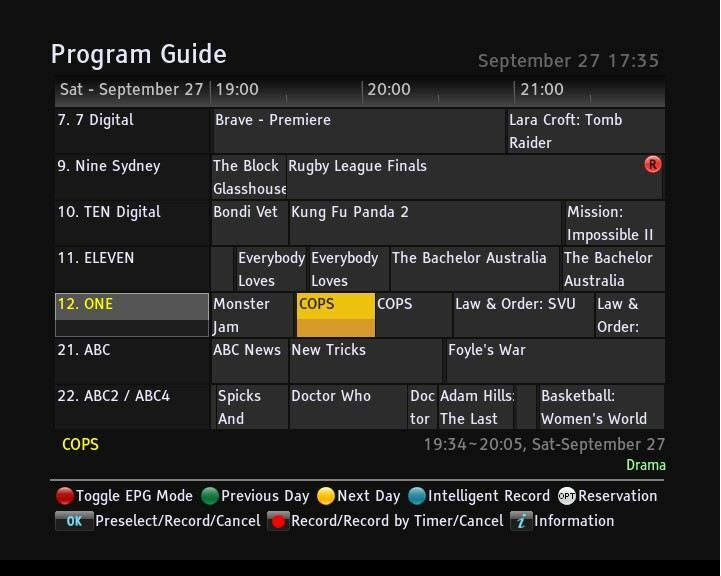 The TAP will only work when the EPG is on the screen. 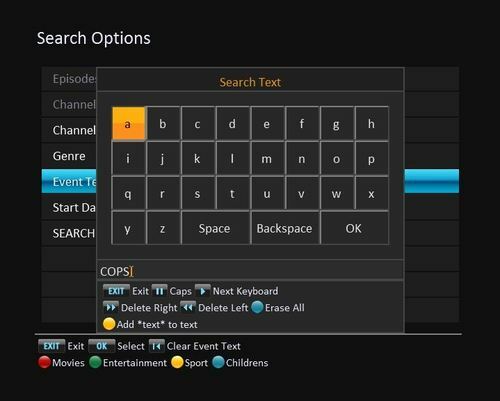 From the main EPG screen if you press the TAPKEY ("Play" by default) then it will bring up the search screen and use the current program title as the default search text. If you then press one of the Search buttons a list of matches is presented. Or if you select the Genre button, a list of matches for events within the same Genre is presented. When on the search screen you can scroll up to the Event Text line and press OK to edit the text to search for. This will bring up the keyboard to edit the text. If you are connected via TMSRemote from your PC you can use the PC's keyboard to enter the text.